Asheville jewelers and metalsmiths Thomas Reardon and Kathleen Doyle recently completed a distinctive copper wall piece commissioned by the Asheville Chamber of Commerce. 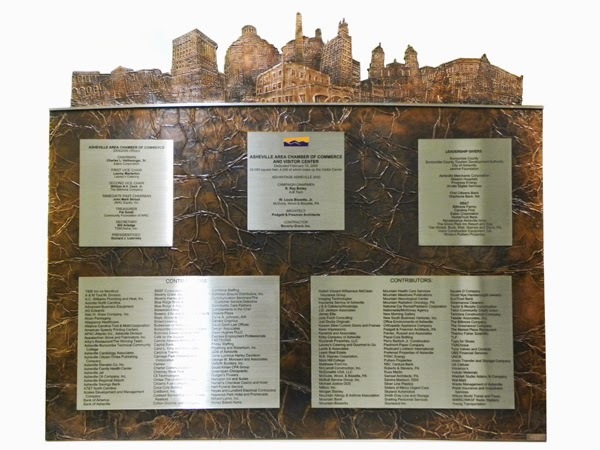 The wall piece, fashioned from embossed copper on wood and four-feet square, shows a montage of Asheville’s iconic historic downtown buildings with the Chamber’s new building, completed in 2006, in the center. While evoking an earlier time in Asheville’s history, it also pays tribute to the Chamber’s many contributers to the building's construction, whose names are etched in stainless floating above an abstract typography of the mountains. The creative, artistic duo — equally well known for their elegant, custom wedding rings, multi-metal earrings, and inventive jewelry — have been successful partners in the world of precious metals and stones for over 40 years. Collectively known as Portfolio Metalwork, they met in California while teaching at the California College of Arts and Crafts in Oakland. As they each built a professional foundation for their careers, a mutual spark between them of creativity and collaboration led not only to marriage but also a lifetime of creating exquisite metal and precious stone creations together. The excellence of their large scale metalwork has led to major commissions including the steel and bronze finials for the Asheville Area Wayfinding Program, and bronze oak leafs for Clemson University’s endowment program. They’ve been designing, crafting, and honing the entire spectrum of metalsmithing skills in their studio in North Asheville since 1995. Visit them at the Historical Biltmore Industries Site (also known as Grovewood Gallery) where you can park free, explore the sculpture garden and grounds, and enjoy two museums, the craft gallery, and the Grovewood Cafe. Their studio is now open most Saturdays from 11 am to 4 pm and Monday through Friday by appointment. To see photo galleries of their custom wedding bands, earrings, and wall pieces, visit http://trkd.com.